Vijay Sethupathi's Mellisai is 50% complete and will feature a new composer Sam CS. Earlier last year Vijay Sethupathi had confessed that he wasn’t keen on listening to any new scripts as he had his plate full with several projects piled up. But the actor did eventually make an exception when Ranjit Jeyakodi narrated the script for Mellisai. Speaking to Behindwoods, the former assistant to Director Ram, Ranjit Jeyakodi said that Mellisai would be a musical romance subject. On the question of why Vijay Sethupathi had chosen this script, Ranjit said it could be due to the fact that musical romance was a new angle for the actor to explore and also probably because the screenplay is very racy. 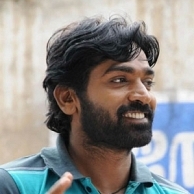 Produced by Rebel Studios, a union of Deepan Boopathy and Rathish Velu, and starring Vijay Sethupathi and Gayathrie and featuring the lens work of Soodhu Kavvum Dinesh Kumar, Mellisai is 50 percent complete with their first schedule lasting around 26 days. The unit is looking to wrap things up in a month's time. Sasikumar and Anurag Kashyap to work together! GV Prakash goes next gen ! What is Nayanthara doing in Bangalore? 'Suriya vs Suriya' or 'Suriya and Suriya'? Will Santhanam repeat the festival magic? Suseenthiran and Vishnu set their eyes on the nation's craze! People looking for online information on Mellisai, Vijay Sethupathi will find this news story useful.